Last weekend we couldn't stand seeing theses paper lights anymore so we made a lamp. 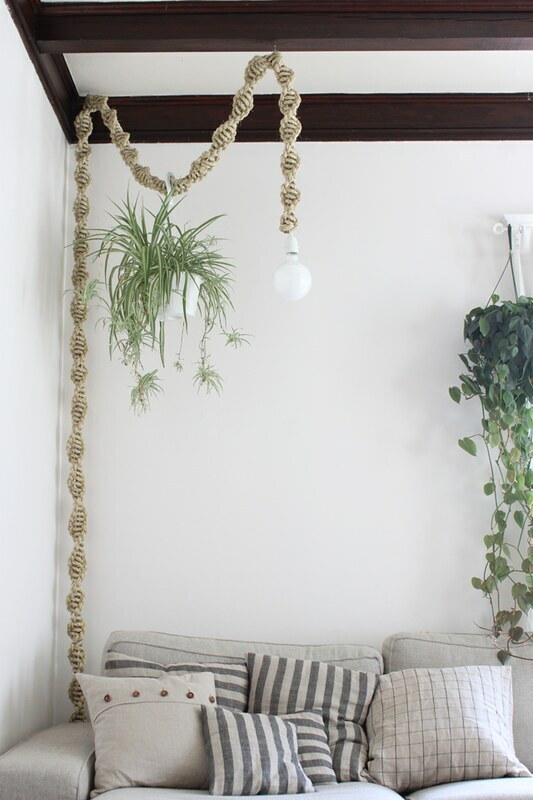 I got the idea of putting rope around a cord from this lamp, but I wasn't sure how to do it. So we did a macrame stitch instead. We're pretty happy with how the rope portion turned out - it's thick and it a lot more exciting than a hanging cord. I thought doing the knotting would be a breeze on a larger scale, but it actually took a lot more arm strength than I imagined: doing 15 ft took about 2-3 hours. I'm trying to decide whether we should put a shade on it. At first I thought I definitely wanted a shade, but now I might have gotten used to the bulb. Now the next step is finally hanging either some wall shelves or some kind of wall hanging by the couch.